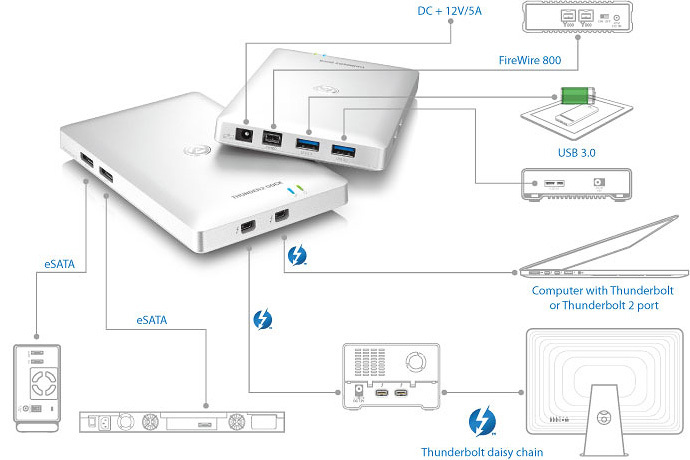 The Thunderbolt™ dock links past, present and future technology to your computer with just one Thunderbolt™ cable. The Thunder2 Dock allows you to access your data on both legacy and future storage drives by providing multiple host ports for USB 3.0, eSATA and FireWire 800. It also has two Thunderbolt 2 ports for daisy chaining additional Thunderbolt devices and storage. The two USB 3.0 ports both support UASP (USB attached SCSI protocol) for increased performance over USB 3.0 but the same ports can of course also be used to connect the older USB 2.0 storage drives. Note: The maximum transfer rate for the USB interface is about 370MB/s. 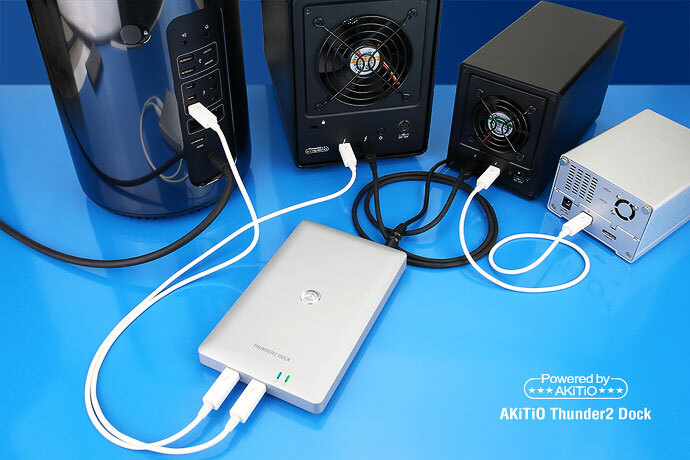 Long a favorite of Mac users but now replaced by Thunderbolt and USB 3.0, the FireWire interface can still be used through the AKiTiO Thunder Dock. Simply hook up your legacy FireWire drives (bus-powered and self-powered) to the dock and you can access all your existing data without having to buy new hard drive enclosures. Not as common as the other interfaces but PC users will be happy to know that there are also two eSATA ports available to hook up external eSATA drives. Thunderbolt™ is a revolutionary connection technology that simultaneously supports high-resolution displays and high-performance data devices through a single, compact port. Thunderbolt™ technology gives you two channels on the same connector with 10 Gbps of throughput in both directions. The extremely fast and flexible Thunderbolt 2 connection now pushes that to 20 Gbps but the two generations of Thunderbolt technology are compatible with each other. In comparison, it is up to 20 times faster than USB 2.0 and up to 12 times faster than FireWire 800. One Thunderbolt™ cable to connect them all. Simply connect the dock to your computer with just one cable and get instant access to all the additional storage drives that are hooked up to the dock. 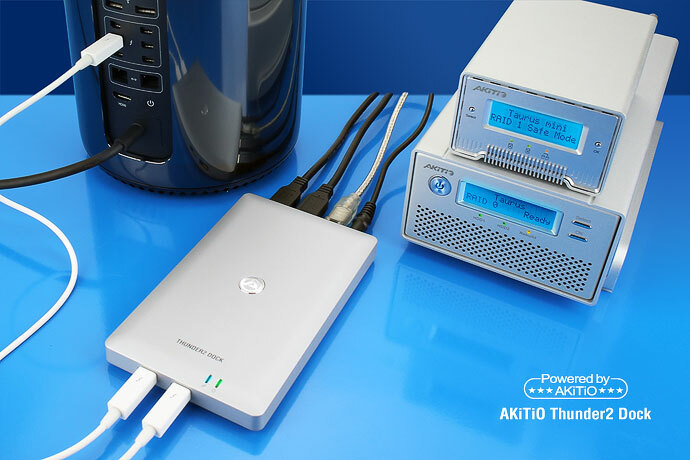 The lighting fast Thunderbolt interface guarantees that you can achieve the best possible data transfer rates. 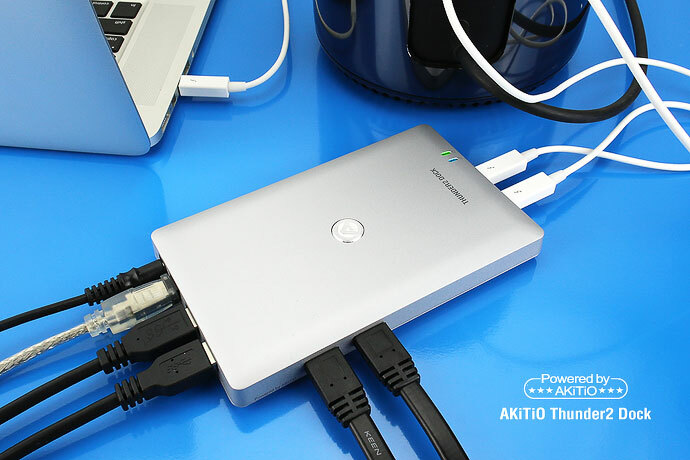 The second Thunderbolt port allows you to connect up to 5 additional Thunderbolt devices (storage or display) in a daisy chain. Thunderbolt 2 also has more than enough bandwidth to daisy chain multiple high-speed devices and it gives you access to the latest 4K monitors. Two independent eSATA controllers guarantee that the performance doesn’t drop, even when a second eSATA storage device is connected at the same time. Please note that the maximum transfer rate for each eSATA port is about 370MB/s. The USB ports can be used to recharge your electronic devices (e.g. iPad or iPhone) over USB on Mac OS X 10.9.2 or above (driver installation is required). 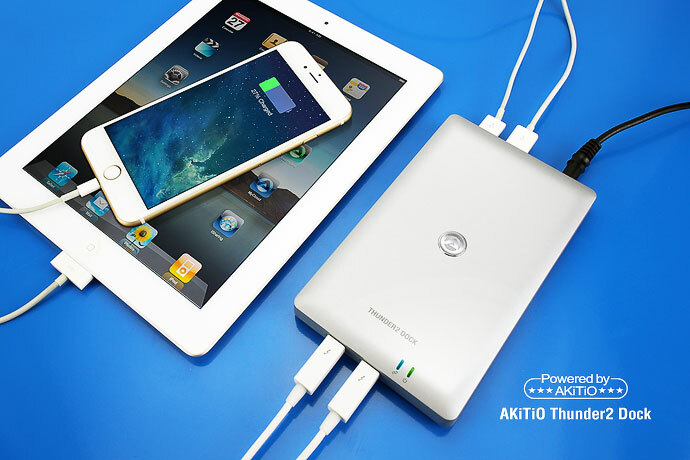 Providing up to 2.1A, the AKiTiO Thunder Dock can even recharge your larger devices such as the iPad. It also provides power for the Apple Keyboard and the Apple SuperDrive for computers that do not have a built-in SuperDrive.